I must admit the first time that I saw Steve Irwin, I could not believe this guy was for real. Is anyone really that passionate all the time about reptiles and wildlife? After watching the TV series for some time, I came to the realisation that the answer was a resounding yes! Steve Irwin is larger than life and an absolute delight to watch. Magna Pacific present this series on DVD for the first time and it is a really well rounded package introducing you to Steve, his wife Terri and the rest of the group that make up Australia Zoo, which is where a lot of the footage takes place. 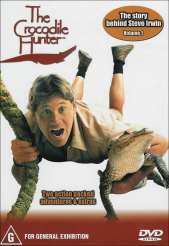 There are two episodes on this disc and it is truly something special for the fans of the series who really want to know what makes Steve Irwin tick. The first episode titled 'Steve's Story' goes behind the scenes to what life was like when Steve as a nine year old boy captures his first croc. The further into the episode I went, the more I admired Steve's enthusiasm for his life and reptilian charges. He has a child like fascination with all things and everything is portrayed as larger than life. A particularly touching part of this episode is when Steve relates losing his dog to the stupidity of someone with a gun. The scene is averted however when we pan back to his face, tears are literally streaming down his face as he is caught up in the memory of what happened that day. It's a compelling watch for fans of the series. The second episode covers the crocs and creatures that inhabit Steve and Terri's Australia Zoo and the distinct personalities of the reptiles there. It's a fascinating look at these ancient creatures and the crocs certainly keep Steve on his toes. The quality of the DVD is very good and makes nice use of Dolby Digital. The vision and audio is crisp and clear and the extras are entertaining and informative. For fans of crocs or Steve Irwin, I gave this DVD a big two thumbs up as it's a rollicking ride in the world of reptiles and big Steve.